Beer may have been known in Neolithic Europe  and was mainly brewed on a domestic scale. 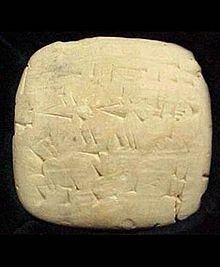 In some form, it can be traced back almost 5000 years to Mesopotamian writings describing daily rations of beer and bread to workers. Before the rise of production breweries, the production of beer took place at home and was the domain of women, as baking and brewing were seen as "women's work". Fermentation begins as soon as yeast is added to the cooled wort. This is also the point at which the product is first called beer. It is during this stage that fermentable sugars won from the malt (maltose, maltotriose, glucose, fructose and sucrose) are metabolized into alcohol and carbon dioxide. Fermentation tanks come in many shapes and sizes, from enormous cylindroconical vessels that can look like storage silos, to five- gallon glass carboys used by homebrewers. Most breweries today use cylindroconical vessels (CCVs), which have a conical bottom and a cylindrical top. The cone's aperture is typically around 70°, an angle that will allow the yeast to flow smoothly out through the cone's apex at the end of fermentation, but is not so steep as to take up too much vertical space. CCVs can handle both fermenting and conditioning in the same tank. At the end of fermentation, the yeast and other solids have fallen to the cone's apex can be simply flushed out through a port at the apex. Open fermentation vessels are also used, often for show in brewpubs, and in Europe in wheat beer fermentation. These vessels have no tops, making it easy to harvest top-fermenting yeasts. The open tops of the vessels increase the risk of contamination, but proper cleaning procedures help to control the risk. Brewing companies range widely in the volume and variety of beer produced, ranging from small breweries, such as Ringwood Brewery, to massive multinational conglomerates, like Molson Coors or Anheuser-Busch InBev, that produce hundreds of millions of barrels annually. There are organizations that assist the development of brewing, such as the Siebel Institute of Technology in the United States and the Institute of Brewing and Distilling in the UK. In 2012 the four largest brewing companies ( Anheuser-Busch InBev, SABMiller, Heineken International, and Carlsberg Group) controlled 50% of the market  The biggest brewery in the world is the Belgian-Brazilian company Anheuser-Busch InBev. The head brewer (UK) or brewmaster (US) is in charge of the production of beer. The major breweries employ engineers with a chemistry/ Biotechnology background.